The towering copper beech tree that has sheltered Lansing’s historic Turner Dodge mansion for over 100 years will be taken down this fall. No date has been set for the operation. Take a last look, but Lansing’s parks director, Brett Kaschinske, warned not to get too close. The tree has dropped some serious tonnage in recent years, owing to heart rot in the trunk. The beech’s wine-red leaves, its elephantine trunk (59 inches in diameter) and expansive, peacock-like spread — wider and taller than the house itself — have sheltered passers-by, wedding guests, concert goers and many other visitors to the Turner Dodge mansion for at least 100 years. On a windless day in late July, the tree dropped a major limb that weighed nearly a ton. No one was hurt, but it was a wakeup call for the city. An even larger limb fell two years ago. Several years before that, almost half the double-trunked tree came down. What’s left of the rotted second trunk can still be seen, spiking about 20 feet into the air. Taking down the tree will be a formidable job, but the openness of the area will make it easier than taking down trees near grave markers in cemeteries or near electrical lines or buildings. The parks board is already discussing what will go in the tree’s place. Kaschinske said he wants to try to rear a seedling from the old tree, but it’s a tricky proposition. “It’s not like starting a silver maple,” Kaschinske said. Fucciolo said the seed crop needs to be at a constant temperature of 40-41 degrees for about 90 days to germinate. Given that these trees - because of how they grow and mature - are prone to this, I'd personally like them to find a tree not prone to this kind of particular aging. More than that, I'd like to see them go local and pick a native tree to replace it with. Apparently, the copper beech is native to Europe. Apparently, cities in the past picked the European beech over the American beech because the former grows faster. I kind of like the idea of the silver maple, or any kind of native maple, to be honest. Thank you for starting this subject page. I believe our affection for trees is a kind of primal thing. it is with me anyways. From my window, Lansing looks like it is set in a huge forest I can see trees in every direction except the west, GM is much more visible after the BWL utility cuts. I would really like to see them [BWL] just take it easy with our trees. The Turner House tree will be missed perhaps they could use the wood to make wooden souvenirs to sell at the Truner House. I never did look up that copper beech so I was surprised to find it is a non-native tree, gardeners of the day always liked to include exotic trees over the native ones which they had just spent the last forty years cutting down. I agree that it would be better to plant a Mid-Michigan native tree in that spot. They have developed a new disease-resistant American Elm, which would be a nice choice for Lansing where so many great elms once stood. It's good to hear about the disease-resistence of these trees. My mom grew up in Detroit and was always so nostalgic about how the elems canopied the streets. 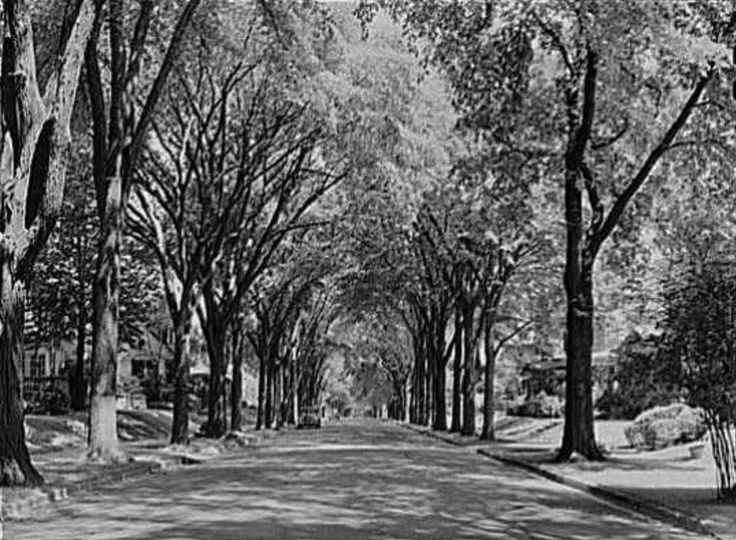 There are some surviving examples of this, but the Dutch elm disease absolutely devestated the city elms there by the 60's and 70's. So the problem is they have trouble stratifying the seeds? Putting the seeds in a refrigerator and setting an alarm for 90 days then transplant to a growth room. They could also take cuttings of the tree and root with rooting hormone. Maybe sell some to others in the city for a city event, like arbor day. Park Avenue the street I grew up on looked just like this. By '75 almost all of the Elms were cut down. The "new" trees have grown into something like this but not nearly as grand. The town planted a new American Elm out in Provincetown to replace a beloved tree and it has done very well and has grown really large. Everyone should take a trip over to Frances Park soon and the Gardens are as pretty as I have seen them for a long time. It seems like the Friends of The Garden and the city have put in a lot of time and money this year. There is expanded irrigation so the lawns are very green and lots of new plantings with a whole new area next to the rose garden. The wisteria is even finally taking to the new cornice, and they are cleaning out the woods of dead trees and debris. Looks so beautiful and it's free! If you would like to catch the last of the autumn color Moores Park is very colorful right now with the grove of Maples there. The river is lower than I have seen it, there are new islands and bars of stones that have formed and have plants growing on top! The water is running so clear but is only inches deep in some places. The trail repairs are still ongoing by GM. Looks like ASK is about ready to move in over there. Sounds nice! Wish I could be there to see. 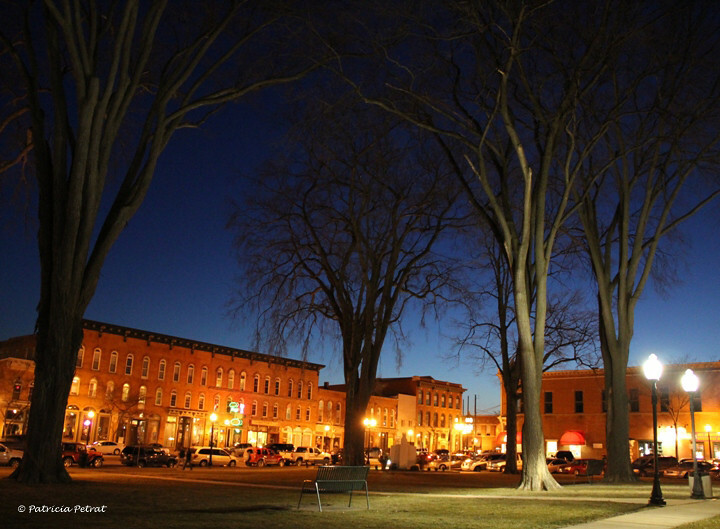 Howell has a weird place in Michigan history, but I have to say it has a really nice downtown. And a great old Carnegie library. I can picture that green space but I didn't realize how cool the trees were. A stand of mature elms in a town center must be pretty rare for this state. The Grand and Red Cedar are both frozen over in REOtown, I have never seen this happen before! I turned into Washington Park to check out the ice rink. At first, I could not really tell where the rink was, there where some truck parked in the area that I thought would be the ice rink, that is when I found it a tiny little square of ice, I have seen backyard ice rinks bigger than this. Was it this small back in the old days? I was all ready to pull on my skates but as an adult, I would have felt a little foolish skating on this kid-sized patch of ice. It was kind of disappointing. In this weather, they could flood a ball field and have a huge rink in an about an hour! I read some distressing tree news in the City Pulse about a plan to replace a drain pipe the goes through Scott Woods, the woodlands off Clifton Street next to Hawk Island Park. This will, of course, require tree removal. Those trees are some the largest and oldest trees in Lansing. I will write and ask if any other option is available like just closing the old drain or diverting it, or replacing it away from the park. I am not hopeful that they would consider any other plan, this is a place where I walk all the time and that I truly love, this year the autumn colors where amazing back there. I would hate to see such a beautiful woodland altered for a drain.